The Alliance encourages cooperation among diverse stakeholders through the Hunger Free Communities initiative and the global National Alliance Partnership Program. Walsh University in North Canton, Ohio, has taken a leadership role in the global effort to build a more sustainable food system and reduce hunger and food waste worldwide. 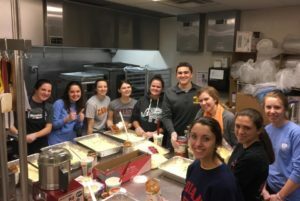 With a total enrollment of nearly 3,000 students, Walsh is a Catholic University dedicated to its mission to develop students to become leaders in service to others, with 100 percent of the student body participating in service work. Founded by the Brothers of Christian Instruction in 1960, Walsh University has promoted an international perspective from its establishment and supports an active global learning program in Uganda, Haiti, Tanzania and Walsh’s campus near Rome, Italy. Issues of hunger and food security have been a focus of several Walsh initiatives, including service programs led by students in the Br. Francis Blouin Global Scholars and the Leaders in Social Justice living-learning communities. The inaugural cohort of Blouin Scholars focused their studies on food insecurity and sustainability and during a 2015 semester in Rome they interned with Caritas Internationalis, the Vatican’s humanitarian and international development organization. The Blouins also spearheaded Walsh’s membership into the national network of The Campus Kitchens Project to repackage and distribute leftover dining hall food to local community partners. With funding provided by an AARP Foundation launch grant, Walsh became the second university in Ohio and the 44th nationwide to partner with Campus Kitchens. In 2014, Walsh University founded and hosted the first Ohio State Hunger Dialogue and became the first Ohio institution to formally join the Presidents’ Commitment to Food and Nutrition Security. 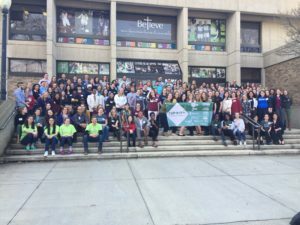 Walsh was also selected to host “Summit Squared: One Movement. Exponential Impact,” an international hunger summit that combined Campus Kitchens Project’s Fourth Annual Food Waste & Hunger Summit and the 12th Annual Universities Fighting World Hunger (UFWH) Summit. Walsh was chosen as the site to highlight how a small, private university can impact the fight against hunger.